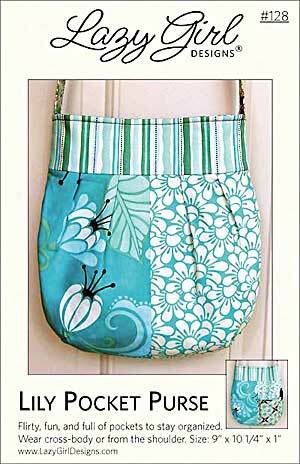 The Lily Pocket Purse Pattern by Lazy Girl Designs is a fun to make bag pattern with lots of pockets and an easy to carry handle. 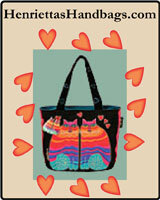 The Lily Bag Pattern by Lazy Girl Designs is flirty, fun and full of pockets to help you stay organized! Wear the Lily Bag on your shoulder or cross-body to rest comfortably and securely at your hip. This project includes darts, pleats, curved seams, rotary cutting and pattern pieces and the Lily has instructions to fully line the bag, make a short or long handle, inside and outside pockets, and a Velcro closure. Finished size is approximately 9"W x 10.25"H x 1"D.
Fabric Option: - To use fat quarter cuts (18" x 20-22") instead of yardage from the bolt, use 6-7 coordinating fat quarters total. You may need to piece handle fabric to desired length. Non-stick pressing sheet may be helpful if working with fusibles. Even-feed or walking foot, size 80/12 or 90/14 sewing machine needle. Rotary cut project and some pattern pieces provided. An even-feed or walking foot may be helpful. This project is designed to be made using 100% quilting cottons. Not appropriate for thicker fabrics or directional prints. 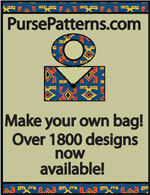 The Lily Purse Pocket Pattern has a total of 15 pages. There is a one page cover photo, 12 pages of instructions and photos, and 2 pages of pattern pieces.